The demand for image interpretation services or teleradiology is rapidly growing across the globe, especially in the UK. Last year alone, the need for UK teleradiology services has increased by 50%. The lack of trained staff with expertise in radiology has moved more healthcare centers and hospitals in the UK to opt for teleradiology services. Today, you can leverage the expertise of radiologists sitting halfway across the globe through top-notch image transfer systems and robust communication technologies. At Outsource2india, we have carefully designed our teleradiology services to UK in partnership with over 80 NHS Trusts in the UK. Teleradiology services we provide are equivalent to in-house reporting, as we have a team of experienced and qualified radiologists who adhere to regulatory frameworks. Our UK healthcare services are not only dependable, but also flexible. This assures the lowest possible risks, giving you an economic advantage, which in-house reporting cannot. If an increase in the volume of work is impacting your ability to cover your day job, then what you need is nighthawk reporting. Nighthawk reporting can help you conform to NICE guidelines and is an excellent holiday/sickness cover for your team. We have a team of leading consultant radiologists with a minimum of 2 years of experience in providing guidance. We can promise you a report within 60 minutes. Whether you require urgent daytime reporting or critical after-hours reporting, our teleradiology services team can assist you with customized 24-hour reporting services. Our team of radiologists will work in partnership with your team to provide you with a tailored teleradiology solution. We offer highly critical 24/7 one-hour reporting, and urgent four-hour reporting solutions. 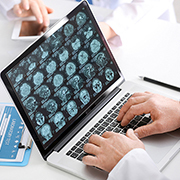 We can provide a final radiology report delivered by HL7 messaging directly to the department RIS or PACS within four hours during daytime and within 60 minutes for a critical report. Outsource teleradiology services to UK to avail 24/7 reporting. Are you under constant pressure to maintain high performance during peaks? Is an increase in sub-specialization taking a toll on you? Or do you require a holiday/sickness cover for your team? At Outsource2india, we offer a flexible radiology reporting services, wherein you can send us work on a need-basis. You will be charged only for what we report, be it a plain film, nuclear medicine, mammography, CT, MRI, or Colonography. Our team will access the referral and other patient data in your RIS, review patient radiology history, and enter reports directly into your radiology information system (RIS). Our team of GMC specialist radiologists can provide 24/7 routine radiology reporting of CT, MRI, Plain film, and CT Colonography examinations within the shortest possible turnaround time. We offer the fastest possible day time reporting (within 60 minutes).We know that accurate, on-time reporting can save money and lives and hence our diagnostic responses are fast and error free. With the increase in demand for services and shortages in staffing, your resources can be stretched. The team at Outsource2india can fill in this gap with Dayhawk services. We have a team of experienced NHS consultant radiologists who are familiar with UK hospital practices. Our Virtual Colonoscopy services are designed to match specific needs. Our services promise accuracy, better clinical focus, and enhanced security. Whether you require regular reporting or seasonal support, our services can assist you. We use state-of-the-art 2D and 3D software to offer you with accurate CT colongraphy services. We have a strong track record in helping clients with backlog teleradiology reporting. We can help you determine the most efficient way to work with local radiology departments in order to clear backlogs. We will continue to support your team even after the backlog is cleared. You can manage any clinical risk quickly with our rapid IT integration. Our team offers audit reporting services on a regular as well as ad-hoc basis. Robust processes built into our quality assurance software can ensure that any discrepancies are identified and resolved at the onset. We can provide a statistical analysis reports on a regular basis or when the audit is complete. Why Outsource Teleradiology Services to UK? Why choose anyone else for teleradiology, when you can partner with the best? Outsource2india is a leading outsourcing firm offering quick and efficient teleradiology services to clients across the world. We have also successfully assisted numerous clients in the UK. With us you can be assured of high quality and on-time delivery, at a cost-effective price. We have world-class infrastructure in place and follow strict security measures. We are the solution for seven-day work pressure, holiday/sickness cover, and the increase in sub-specialization. Partnering with us for teleradiology services can help you to clear backlogs and continue to provide efficient, reliable, and timely teleradiology services. What are you waiting for? Get in touch with us right now.